Contains jasmine absolute, one of Mother Nature’s most potent and seductive aphrodisiacs. Jasmine, clary sage and ylang ylang to make you feel like a lover. The power of these aphrodisiac oils lies in their ability to relax you at the same time as warming your heart and other body parts. The ancient perfumers of the Mediterranean knew a thing or two about lurve and we're using the methods they used thousands of years ago for the same results. A somewhat Lush 'cult' product. Why? Well that I really don't know. That's part of the reason I bought it, to see what all the fuss was about and it's kinda pretty with the flower and everything, right? It has a very strong smell to it, quite hard to describe but I didn't find it to be overpowering. It wasn't like anything I'd had before from Lush (or anywhere else). There is just one gripe I really really didn't like. It has a cute little flower in it made of rice paper, I didn't know what it was made of till after I used this so I popped this in and noticed something still floating around on top after the rest of the Ballistic had disintegrated. EURGH! Horrible mushy papery stuff! I actually checked reviews for this and there's a fair balance that say it dissolved and others saying it didn't. It feels really horrible. All slimey and just the thought of it is making me cringe. 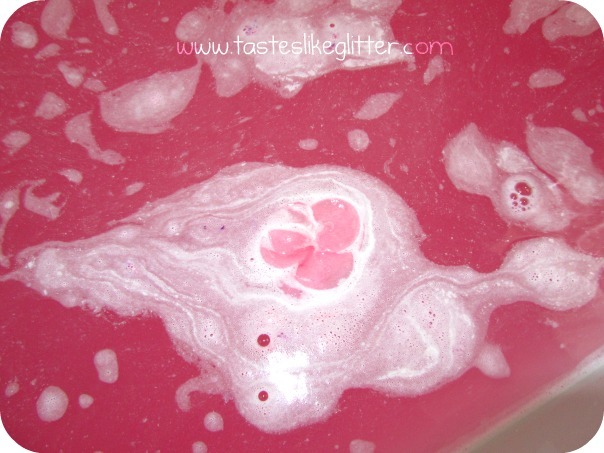 I do love Lush and the flower is a nice touch but when it's left floating around that's where I draw the line. If you can cope with a slug like flower then this is actually a really nice scented Ballistic and it lingers on the skin and in the bathroom for quote sometime after. Have you tried this? What did you think? Do you think it's worth of it's 'cult' status?